The fencing was repaired but the main aspect of the work was to build a huge earth mound terrace at what had been called the Abbey Wood End. This construction was named Spion Kop, or the Kop, by the multitude of soldiers who had been fighting recently in the Boer War, as during this conflict the Spion Kop was a towering hill that was assaulted by the British forces and defended by the Boers as part of the relief of Ladysmith. The much expanded terrace received its new name during the practice matches that were played as pre-season training games where the possibles played the probables in August 1904, and the only crowd control was wooden crash barriers aligned with the fencing surrounding the pitch. Also, parts of the North and South stands were supposed to be rebuilt but little came of this, other than a general refurbishment of the South stand. This commission was to cause Arsenal much trouble for, in 1910 as the club went into voluntary liquidation, they received an unwelcome bill for an apparently unpaid £1,300 from the famous football Architect Archibald Leitch. If little else, there were new dressing rooms in the South stand for the top flight teams to appreciate. The architect of the 1904 promotion was Harry Bradshaw who had been the manager since 1899 and had incrementally built a strong team. He had resigned in January of the promotion season, apparently at loggerheads with the directors, but agreed to remain in post until the end of the season before moving onto Fulham. The new man was Phil Kelso, probably the hardest manager ever employed by the club. He watched the promotion game on 25 April 1904 as part of the handover process with Bradshaw, so he knew at first hand what he was taking on. From a board perspective the acumen of chairman John Humble and the financial backing of George Leavey was worked successfully, together with the directors, getting the club on an even financial keel. The club made a profit of £1,674 in this season which was an incredible achievement seeing as 5 years before they almost went out of business owing to the knock on effects of the Boer War. On the media front there was intense interest both nationally and locally, the Kentish Independent producing collectable colour postcards of games between Nov 1904 and March 1905. The paper also had copious reports of each match and much in-depth information for the Woolwich public to pore over. 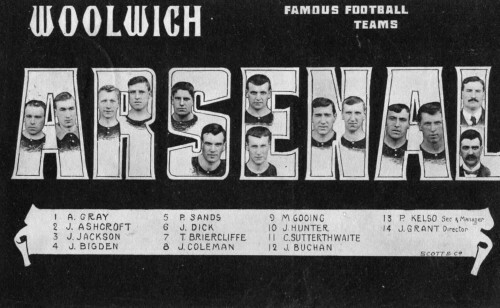 Woolwich Arsenal also appeared in all sorts of national press articles highlighting the star players, such as future England players Jimmy Ashcroft and Tim Coleman, Anglo-Australian Jimmy Jackson and the amateur Percy Sands. On the field it took a number of games before the first goal was scored by Charlie Satterthwaite, the centre forward who finished the season as leading scorer with 11 goals. The season also saw the debut of probably the most talented player to grace the Manor Field, namely Andy Ducat. The team finished a creditable 10th in the league, but were knocked out of the FA Cup after a replay in a hard fought tie against Bristol City. They also had time to despatch a Parisian team 26-1 in an embarrassingly one sided friendly in Plumstead. The replayed match in April 1905 was won by Woolwich Arsenal 2-1 to deprive Everton of the League championship. Newcastle United were champions with 48 points from 34 games whilst Everton were runners-up with 47 points and had the Thames inspired mist to thank for their misfortune. 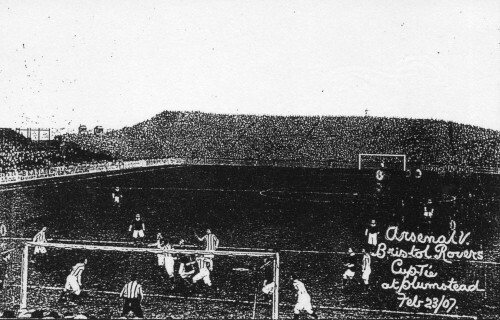 A few League games at Plumstead attracted in the region of 30,000 fans against the giants of the game at the time – Newcastle and Aston Villa – while the match against Sunderland was a ground record of 36,000. 1904-05 saw by far the largest average crowd size of any season while Arsenal played in Plumstead of 22,882, which was comparable though slightly less than the first season at Highbury where the average was 22,973. Away support during the season was incredible. On many occasions thousands of fans travelled, giving the team a huge boost and causing havoc with the railways and home town with their fireworks and rowdy singing and invasions of the opponent’s pitch. The Torpedo Factory workers from the Royal Arsenal provided these fireworks which were thrown on the train journey going to the game, in the town centres and at the game. The trip to Notts County in December 1904 was an official club sponsored excursion which doubled up as a seasonal Christmas party for the travelling band of 2,000 followers. 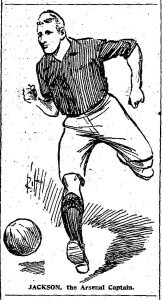 Arsenal won 5-1 with goals from Satterthwaite and a hat-trick from celebrated amateur Tom Fitchie. The referee had to stop the game and request that the fireworks exhibitions desist, as they were being let off after each goal and thrown onto the pitch from different sections within the crowd. Additionally with the fire-crackers as accompaniment, the Arsenal crowd in the second half ceaselessly sang “Farewell to you, Bluebell” a music hall number about soldiers, love and war. After the game the crowd rushed onto the pitch and carried players from the field including man of the moment Fitchie. All in all it was an exciting time to be a player, official or fan of Woolwich Arsenal at the start of their Plumstead halcyon days. In fact, they were so confident that they produced a new crest for the club based upon the 1901 Woolwich Borough crest. 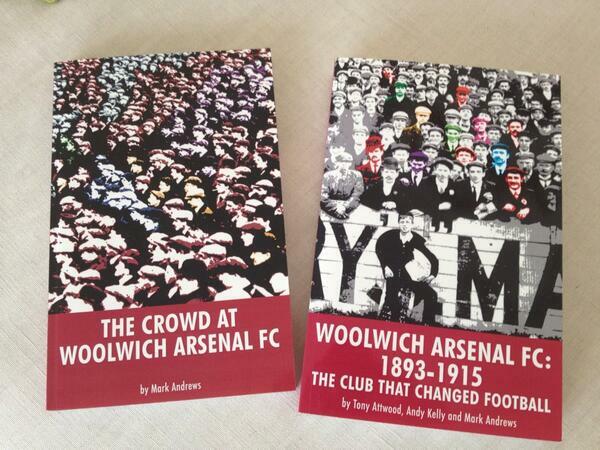 The Woolwich Arsenal Football Club crest appeared in the “Book of Football” complementing an article written about the Gunners by the vice-chairman of the club, Arthur Kennedy. 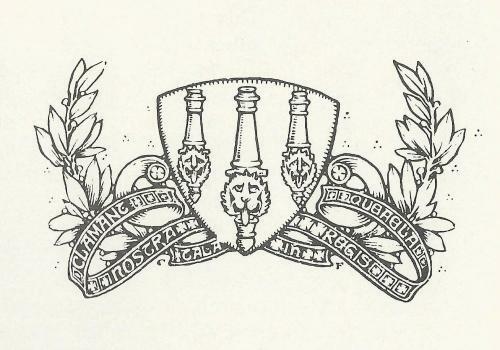 Woolwich Arsenal Crest 1904-5 – from the Book of Football. This season we’ve been asked to write a regular page in the official Arsenal Magazine based on a classic match featuring the opponents for each game we play in. Magazine and Programme editor Andy Exley has kindly given us permission to reproduce the work on our blog. We will also be including additional material that didn’t make the final edit of the Magazine. It was just as well that the debt to Archibald Leitch was paid as three years later he was designing a new Arsenal Stadium at Highbury . Leitch is very over rated and he did Arsenal no favours at all. He did nothing of note at the Manor Ground and his original stand at Highbury only lasted 23 years before being pulled down for the majestic East Stand.